BC Place Stadium , Vancouver , Canada. BC place Stadium is the largest air supported domed stadium in the world.It 's located on the northside of False Creek which was inaugurated on 19th July 1983 & seats 60,000. World Expo 1986 was held here.This is the venue of the opening & closing ceremony of 2010 Winter Olympic Games. It's the first Indoor Olympic stadium in the history of olympics. 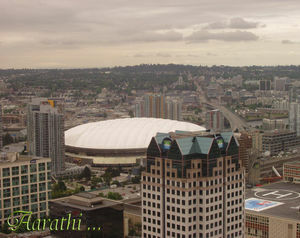 Photo taken from the top of the Vancouver Lookout Tower. Commentaires sur BC Place Stadium , Vancouver , Canada.